This deserves reposting every few weeks to remind us all what public services are for, and that chart is a mortifying reminder of how much more civic responsibility for those struggling we need to take. Is there a way to find out how much is collected in property tax for a certain Ward in a given year? Furthermore, I’d like to know the breakdown of that collection – how much is spent on this/that. Until we have those exact details, we should probably refrain from crying about taxes being too low or public services in our community being insufficient. Are you suggesting that each ward pay its own way? If you’d like a breakdown of taxes and what we get, here’s a couple of things that might help. I take it you’re happy with things as they are in the city? I thought Trololo’s question was reasonable & clear – How much property tax (from actual home owners) is collected in a ward, in any given year? After all, property values & services in Ward 11 are not exactly the same as Ward 4 or any other Ward through the central corridor of our city. 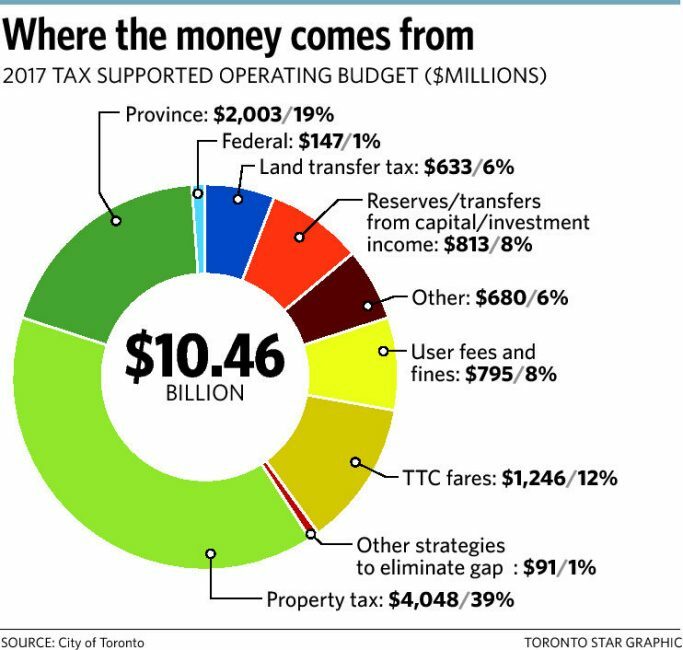 As for a property tax breakdown, again your favourite reference source seems to be the Toronto Star. It shows once again, that much of our tax dollars are spent on salaries & benefits for our very fortunate city employees. Folks in the private sector should be so lucky, generally. Like you, the Star has an obvious bias from a left leaning perspective, which is a good & valid stance. But, it’s not the only perspective at play here. And, lest we forget, it’s important to hear the other media perspectives that don’t always concur with yours or the Star’s. There are a few choices, with some better than others: like the Globe & Mail; Post Media’s Toronto Sun & National Post; CBC news & current events (Radio 1 & TV); Bell Media’s news & current events (Newstalk 1010, Newsnet, CP24); Roger’s news & surveillance (City-TV and 680 News); Global’s News & current events (TV and radio, AM640), to name a few. Plus, the World Wide Web. It’ll keep you busy reading, watching and listening, forever. As for Mayor Tory, fair enough – you don’t like him. And so, you’d prefer who given the choices? Political leadership will grind you up and spit you out. I may be wrong, but Tory has not embarrassed us once. And, he’s indefatigable, always ready to represent, with a certain amount of class & dignity, each and every time. He seems to care about serving. You tend to call him “Rob Ford Lite”. And, the right of centre media types and followers don’t find him right wing enough – he’s “mushy middle” or some such wishy-washy thing. So, he’s what, a centrist? Who’s willing to consider a variety of perspectives and then reconsider those perspectives before he pushes hard in any one direction? Could be worse, I’m thinking. Is he man who’s trying his best to take into consideration the concerns of all Torontonians, carefully & respectfully? Is he a man willing to hear & listen to the howls of the watchdogs, and their contrarians from the fiscal right side of the spectrum? If so, then yes, is he very likely to take a bullet from either side. I say, thankless bloody job really, being fair minded and not too obviously, partisan. My question over the years has been: Why can’t we have both in politics – someone who is fair, decent, hardworking, an admirable (civic) representative who is totally respectful and aware of most of the disparate views within the entire area, while keeping an eye on the purse strings, as best possible. One with a reasonable vision toward the present & future, to step up and assist where needed while being careful with the budgetary process that seems to be stressed by the usual suspects, including escalating costs, wages & benefits. Sadly, it’s not possible to have both, is it. Finally, I used to come to the WestonWeb for local events & concerns. But, now I’m finding the lines often blurred between Weston area issues and many other GTA and regional concerns, with no shortage of editorial commentary included here, often demanding speedy solutions. Your prerogative, and fair enough. And, may I add, this is a mild criticism. But, forgive me if I continue to fine tune my bullspit filters – via other sources available in order to try and discern who’s truth to accept and when, before it morphs once again. And, it always does morph, always will. As for the “happy with things as they are in the city?” query to Trololo? Hey, there’s always room for improvement – in what is largely acknowledged by many, a pretty damn fine city (and sure, including Weston). Thanks for your effort & the web site – I trust it comes from the heart and is sincere. Thanks for your response. Just a couple of points: the reply to Trololo was to seek more information given that s/he seemed to advocate refraining from ‘crying’ about taxes until we’d determined the financial ins and outs of each ward. S/he seemed to imply that spending for each ward should be based on the money raised there. Apparently that’s not how it works. If your best endorsement of our mayor is that it ‘could be worse’; you’re right (and it has been) but surely we need to aim higher when choosing a mayor. Far from being a ‘centrist’ his actions and voting record seem to reflect a concern for Toronto’s wealthy rather than its weakest citizens. He’s probably a very nice man doing the best he can for the people he represents. Finally; sorry you seem to be disappointed in some of what you have read here. Let’s hope you continue to read Weston Web for your local (and not so local) stories but many of our readers expect a viewpoint rather than a regurgitation of press releases and podium photos (not that we don’t do those too). Feel free to contribute your interesting opinions as many of our readers do. Exchanging ideas through a dialogue leads to understanding, so thanks for your contributions. Thank you, Roy. I would also add that while home property taxes are the lowest in the GTA, business property taxes are scheduled for 4.5 times that rate. And that includes 49% going to education. So when the consumer leaves their neighbourhood to shop at a big box in say Vaughan or Mississauga or Peel or Durham, they are diminishing a Main Street retailers ability to pay those taxes. The taxes that allow them to drive on paved streets (as you stated), children to go to school, etc. It also diminishes their ability to pay increases in minimum wages (like tomorrow’s increase) and other benefits. Sadly, people forget that business owners pay the brunt of the taxes in Toronto while keeping our house taxes low – because homeowners ‘technically’ are the voters and business owners are not. Oh well…lots of other juristictions have lower business taxes…..a business can relocate, appeal for tax relief or move to a lower tax juristicion…. Next Next post: Reasons to be cheerful.